Theater is often about confessions. This is an article that incorporates a theater review. In this case, the theatrical confessions we refer to are somewhat exaggerated true-to-life experiences as told on stage by writer Josefina López through director Corky Domínguez, a long-time López collaborator. But more specifically, there will also be confessions of a personal nature that relate directly to this site and the paper bills itself as Brooklyn &amp; Boyle. With the adaptation of her debut novel, Hungry Woman in Paris, into a stage production titled, simply, Hungry Woman, López has created an entirely new genre she calls "cineatro." Introducing Hungry Woman for a recent audience, she confesses that the reason we are seeing the book as a play rather than a movie is because she doesn't have the millions of dollars it would take to make a film version. The other confession is my own. I have known Josefina for years and it was, in part, her novel that launched the paper now known as Brooklyn &amp; Boyle. And in the interest of full disclosure, I have long considered her a good friend. The short version is that four years ago, I found myself producing an poetry reading with Gloria Alvarez and Ruben "Funkahuatl" Guevara down the street from the old Casa 0101 (now known as Little Casa). López offered to read from her her book, which—according to her—had some "steamy" passages. In the end, López had a schedule conflict and would not even be in the country for our "Literotica Chicana" celebration at East Side Luv, a watering hole and wine bar that had still not yet been "discovered" by the rest of Greater Los Angeles. We packed the house and extra bartenders had to be called in. It was then that I understood that we were part of a community that was ready for good, smart, edgy writing presented in a viable way, that Boyle Heights and the Greater East Side were home to hundreds of great literary voices, many just emerging and many who were already working in the national and international arenas. If our poetry could fill up a trendy night spot across the street from Mariachi Plaza, I reasoned that our community could support a paper the East Side arts from here to Highland Park and Eagle Rock. So that's how Brooklyn &amp; Boyle was really born. When I told López what I was thinking of doing, she responded positively, even offering let me publish the prologue from her newly released novel. I received my review copy of Hungry Woman in Paris directly from Josefina and devoured it in one sitting, promptly falling in love with the protagonist, a feisty, beautiful, intelligent and politically savvy journalist named Canela Guerrero who gets burned out and nearly gives up when she realizes Bush II has been re-elected, leaves her successful fiancée and goes to France, where she enrolls in a prestigious French cooking school. As a play, Hungry Woman works on too many levels to list. The stellar performance by Rachel González in the uplifting lead role is the fulcrum for sterling performances across the board. The production becomes, as such, ensemble theater at its finest. 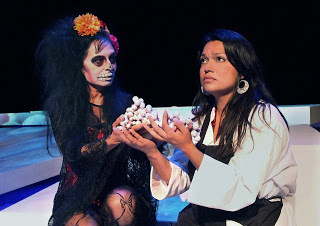 Mary Mendoza as the figure of death, who shows up wearing her party dress in true Dia de Los Muertos tradition. is superb as Canela's foil at every turn. The dialogue is witty and spontaneous. Sub-plots are unexpected and captivating. The wry, perfectly-timed humor is complimented by the subtle and serious socio-political commentary, which is indelibly nuanced and evidence of the author's maturity. Staging for the production is an avant-garde collection of canted rectangles scattered across the floor, which also serve as screens for projections from directly above, that take the audience literally around the world and into private bedrooms. Costumes, sound and lighting underscore a moving and thoroughly satisfying theatrical feast. To put it simply, the world premiere of this delightful new play is a marvelous success, and it is more than likely that the final three performances this weekend will be sold-out. It would be wise (and yes, López is responsible for our regular "Ask a Wise Latin" column) to make reservations in advance. Call Casa 0101's Box office at 323-263-7684 or e-mail; tickets@casa0101.org. You can also buy online at www.casa0101.org.